Home » Blog » More than good food on the menu! More than good food on the menu! As a presenter I take my audience on a journey of discovery so there is nothing more rewarding than watching the sparks of an idea I planted burst into flames of inspiration like this! Lyn was a guest at the Best-of-Bedford, Best-of-Luton and Bedford Chamber of Commerce event where I had been invited to give a Social Networking presentation at Belini’s Italian restraunt. I’m looking forward to giving more presentations like this at TheBusiness Club Cambridge, The Business Club North London, The Best of Cambridge and many other venues around the country. I’m enjoying seeing how my social networking evangelism is having such an amazing impact on people’s businesses, helping them to find new clients and improving their bottom line with so little effort. I had to just drop you a line before I start to plough through my emails to thank you for your good, clear and honest presentation yesterday evening – even I understood the benefits of ‘cyber networking’. I’m going to get straight on to it. My teenage sons will be so impressed next time they’re home from Uni that their technophobe mother is joining to twitter and network online. I may even ask their help to start a facebook entry too! I agree, Lyn, Ian is an excellent communicator especially around this labyrinth topic of blogging and twitter! Like Jane before me Lyn’s comments about Ian are spot on! I found the evening fascinating. 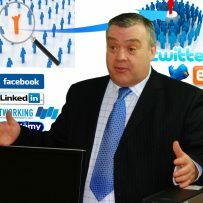 Ian very effectively linked up on-line business networks liked LinkedIn, blogging and social network sites like Twitter. I’ve learnt they all depend on one another. Thank you for an inspiring presentation Ian and for your willingness to help me with the on-line profile of my business.